China takes about one fourth of the global game market, with its 600 million gamers in China generating $24.6 billion according to Bloomberg. China’s digital advertising market will reach over $50 billion this year. 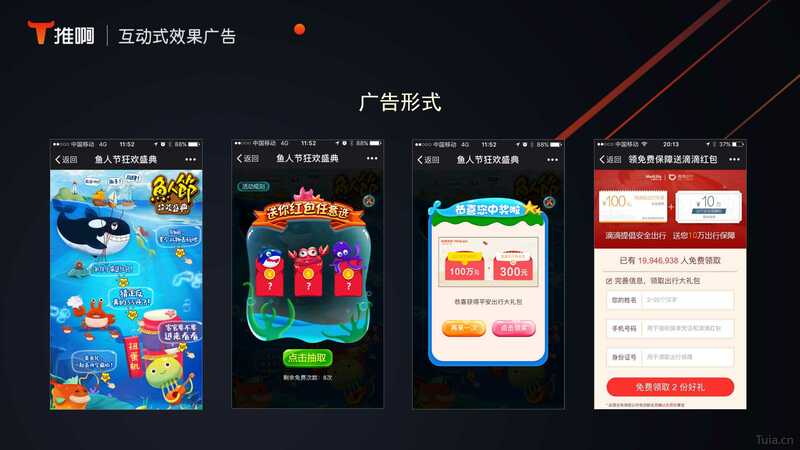 Now a Chinese company Tuia is betting on these two, huge gaming and advertising markets, to integrate a game format advertisement into mobile phone applications. The Hangzhou-based mobile advertising company is now the advertising platform for major internet companies including Baidu Waimai, Ping’an Insurance, and vip.com. Tuia (推啊) is an interactive advertising platform, comprising two parts: an advertising platform app and a platform for advertisers. Tuia announced today their interactive performance-based advertising (互动式效果广告) as a new way to engage and monetize users. Tuia’s interactive performance-based advertising allows its users to play the game and get coupons. When a user opens an application on the phone, a game pops up on the screen. After playing the game for a few seconds, the user can get RMB 100 coupon for an e-commerce platform. “Such highly interactive advertising engages the users with a fun game so that they won’t even feel that they are exposed to an ad. Users win the coupon by their own efforts, so they will be more likely to spend it,” said Li Shanhong, president of Tuia. The company says the click-through rates (CTR) of Tuia’s interactive advertising is around 20 to 40 percent, with the highest of up to 49 percent. According to the data from Celtra, the average CTR generated on the mobile phone in the United States in 2013 was 1.37% in 2013. Data from 2015 suggests that the CTR for native ads was only 0.38%. “Interactive advertising is unique in China because the mobile internet is developing fast in the fields of mobile games, online financing, car and bike sharing, and live streaming,” Li Shanhong, president of Tuia said in the press release. Intense competition in China’s advertising market has prompted mobile service providers to offer all sorts of discounts to attract users. Chinese users are accustomed to getting coupons whenever they use the applications on the phone. Tuia also uses these coupons as a reward to get their users to play the games. “Advertisements in applications are mostly information-based advertising at the moment, where information is simply showing up on the screen. It is an inefficient method to make conversions, but it’s easy to increase the CTR in such advertising,” Li says. “By the end of 2017, the interactive performance-based advertising is expected to make Tuia the third largest advertising platform after Baidu, Alibaba, and Tencent, the top three Internet giants in China,” said Li.